Over the past week, I have noticed a trend with the people I spoke with. The one thing IN common with all is their “plans” failed. I found it weird that all these people had similar stories. Each person had “planned” to do something which did not work out. One person was extremely mad over his inability to complete his goal. However as he explained his plan I interjected with the following…. Now I am not saying “do not make plans”. I actually believe you should be making plans. In fact your plans should be as thorough as humanly possible. However it doesn’t matter how much you plan anything. It doesn’t matter how good your plan is, how well written and thought out it is. You could write the greatest plan the world has ever seen but if YOU DON’T WORK, none of it does. All these plans depend upon YOU to make them work. All the brilliant ideas depend on YOU to bring them to life. We all have plans or make plans but let’s be real clear, when you write your plan down, all you have is ink on paper. You either EXECUTE or MAKE EXCUSES. There is a saying often used FAIL TO PLAN, PLAN TO FAIL. However, if you are not taking action, you are getting no where. If the plan doesn’t work or things don’t go according to plan, does that mean your plan has failed? For most people they use this as an excuse for them to abandon ship. Those plans, along with you, need to change course. If the plan needs to be reworked or rescheduled then that is what you need to do. If you blew a deadline with your plan, then I recommend you learn to assign priority levels to your plans. On one end of the scale we have TOMORROW. WHAT? You know these are those plans that you always say “I’LL DO IT TOMORROW”. These have little value which is why you always put them off until TOMORROW. 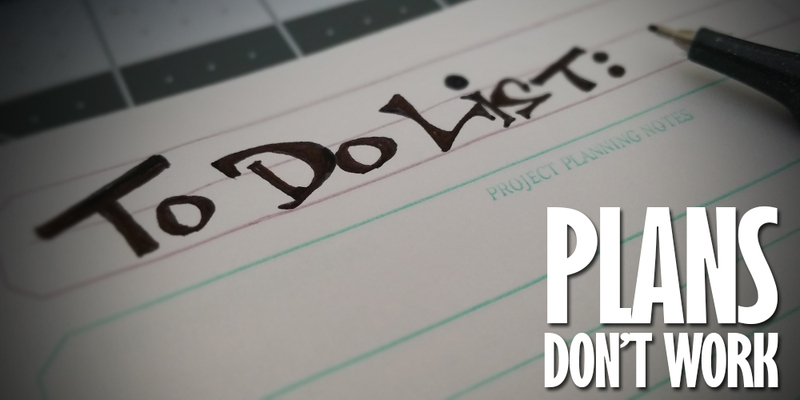 IMPORTANT plans have more value and you tend to complete these in a timely manner. On the opposite end is EMERGENCY. At some point in your life you’ve had an emergency. Remember how you dropped everything to address the issue immediately, well the same action is required if your plan is of utmost importance and has a hard deadline. Look at your plans, set the priority levels and follow through accordingly. So are you WORKING or are you MAKING PLANS?